NEIGHBOURS in Longwell Green had more reason than most to celebrate on New Year's Eve. For the five Court Farm Road residents ended 2018 on a high after winning £30,000 each. 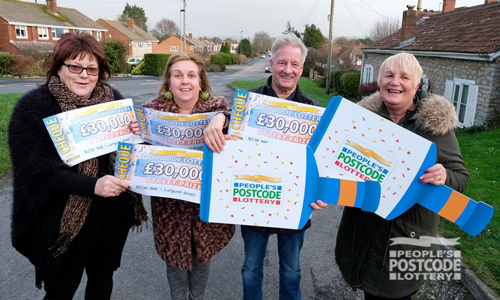 They scooped a total of £150,000 when BS30 9AE was announced as a Street Prize winner in the People's Postcode Lottery. Winner Hazel Price, who has eight grandchildren and one great-grandchild, said it was a dream come true: "I've been shouting 'come to Bristol' every time I see the Postcode Lottery advert on telly so when I got the call from the team asking if they could come to visit me, I thought all my prayers had been answered! I've never had this kind of money in my life before so I just can't believe it. "I've worked since I was 15 and it's only recently that I've been able to retire after spending 28 years working as a post woman. I've always made sure the family are taken care of but I'm going to spoil myself with this. It means that I'll be able to really enjoy my retirement now so this win is definitely for me and my husband Andrew. I'm just ecstatic!" Self-employed builder Andy Smith was joined by his wife Jenny when he received his cheque. He said: "I'm in disbelief – I thought my friends who I play golf with were pranking me. My daughter signed me up to play as a birthday present a few years ago, so I'll definitely need to say a big thank you to her. It's very nice to be going into the new year with an extra £30,000 in the bank." Andy and Jenny are planning to put some of the windfall towards a dream holiday for the family. Jenny said: "We've always talked about taking our three children, their partners and our four grandchildren to Florida and have been saving up every fiver we get, but I think we'll be able to stop saving now we can add this to the holiday fund." Diana Lewton, an HR advisor at the University of the West of England, was another winner: "I've been grateful when I've won £10 and thought this might be £1,000 so this has just blown me away. I'm going to help my son and his partner out as they've just moved in together and I'll also be treating my boxer dog Ruby to a brand new leather lead and collar. I know the other winners as we walk our dogs together so it's lovely we're getting to share this moment together." Also on the winning road was office administrator and mother Tracy Hall who said: "This is a brilliant start to 2019. I'm going to do a bit of retail therapy and get myself a bag, shoes and a pair of earrings. I'd love to book a nice hot holiday too. My husband Bob and I got married in the Seychelles two years ago so we might even go back there. "My daughter is kicking herself as she stays at the same postcode but never signed up to play, but I think she'll be joining now. It feels brilliant to be part of something that raises so much for good causes but it also feels brilliant to win!" People's Postcode Lottery ambassadors Judie McCourt and Danyl Johnson were in Longwell Green to present the winners with their cheques. The fifth winner wasn't around to receive their cheque but now has the money. People's Postcode Lottery players have now raised £371m for good causes, with 32 per cent of the ticket price going to charities. In 2018, it supported 1,500 grassroots good causes with grants, helping deserving projects across the country. Last year, Keynsham charity Make a Move was awarded £7,020 to run music, dance, and therapy sessions in primary schools for disadvantaged children.